Garlock BLUE-GARD 3000 Aramid fibers with a Nitrile Binder. 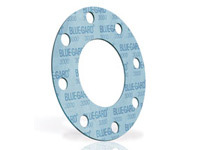 Garlock's most popular compressed non-asbestos gasket sheet, made of aramid fibers, high-temperature fillers and a nitrile (NBR) binder. Ideal for utility services.